Why is poaching such a problem? Poaching is a problem for a number of different reasons which extend far beyond the popular view that the only reason we fight poaching is to save the life of an animal here or there. In discussing these impacts it is helpful to break the effects down into different categories. The environmental impacts of poaching are sometimes clearly visible and sometimes much harder to identify, at least in the short term. The most obvious impact is a depletion in the number of wildlife present in a given area. The defaunation of an area due to poaching flows from the immediate impact of killing an existing animal, the medium term effect of reducing breeding numbers and hence the rate of reproduction, and the long term effects of thinning the gene pool and the symbiotic- and often irreversible – impact this has on overall biodiversity. This is not an abstract or ‘maybe one day’ problem. Just over a century ago there were over one million rhinoceros in Africa; now, poaching has directly led to the extinction of wild rhinoceros in Mozambique, most of western Africa, and many other regions across the continent. According to most reports, the number of wild rhino left in Africa hovers around 22-25,000 – that’s a reduction of around 97% over the last century. Further, according to the WWF, tigers, which could once be found across almost the whole of Asia, have had their wild range decreased by 93% over the last 100 years, and have suffered a numerical decline of 97%. 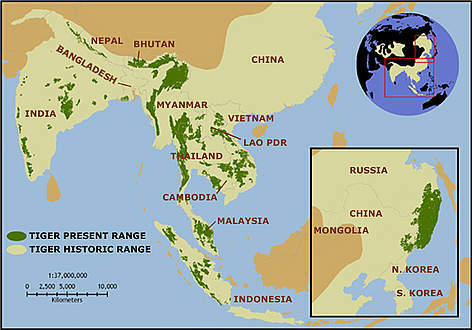 Tiger range, both historic and current. Image from WWF. Additional to the drop of animal populations, poaching affects ecosystems. Natural ecosystems often develop a rather delicate balance between different types of fauna and their local habitat. Because of this, in terms of cause/effect the depletion of one species is analytically bound to the effects this has on other species. For example, the removal of predatory animals can result in an over-abundance of prey animals resulting in the destabilization and decline of vegetation; the decline of prey animals can lead to drops in predator numbers because of a reduction in food supply. Further, certain species are considered ‘keystone’ species in their local environment. For example, many species of animal – such as elephant – are responsible for the distribution of plant seeds and hence a local extinction of elephant has a heavy consequence for local vegetation. These changes in vegetation affect other animals along the food chain, and the circle continues. The negative economic impacts of wildlife crime are difficult to quantify but they are very real. Across much of southern Africa wildlife tourism plays a vital role in local and even national economies and a decline in wildlife numbers due to poaching has immediate flow on effects in terms of financial cutbacks, job losses, and overall economic sustainability. Further, as with other highly profitable illicit markets such as illegal narcotics, poachers and wildlife traffickers profit directly from state weakness: it is this weakness, which manifests itself as poor enforcement or regulatory platforms and state corruption, which facilitates the widespread existence of large criminal networks. Criminals therefore have an inherent interest in actively undermining state economic development – a particular problem in a number of already vulnerable countries in the developing world. The impact poaching may have on human health is not widely discussed, however it can be significant and the emergence of numerous zoonotic diseases has been linked directly to wildlife crime. The outbreak of SARS in Hong Kong has been traced to the human contact with and consumption of poached meat available on black wildlife markets. Ebola, one of the world’s most horrific diseases, has had outbreaks in Africa directly linked to the poaching and consumption of primates. Further, bird flu (H5N1), Monkey Pox, and Heartwater Disease are additional examples of diseases directly facilitated by the illegal wildlife trade. Indeed, according to the US Center for Disease Control (CDC), 75% of diseases reach humans through animals: a fact made more worrying because the illegal entry routes used by smugglers bringing exotic wildlife and their parts into international markets are unable to be effectively monitored, let alone quarantined and controlled. As well as the impacts listed above which all have some kind social dimension, the social impacts of poaching are harder to objectively measure and their seriousness often depends on each person’s own sense of ethics and morality. For instance, it is impossible to put a monetary value on the ability to see wild animals in their natural environment and not just in a zoo, just as it is impossible to put a monetary value on the social impact of a decline in wilderness areas. However, for many people – myself included – the natural world is a raw , inspiring and intoxicating place, and the exploration of it is a tremendous personal pleasure. What if our children could never see it the way we have? And what about their children? These are individual questions we must answer for ourselves. The effects of poaching and the illicit wildlife trade on animal welfare is also impossible to put a monetary value on, though most people would be appalled by some of the details. Poachers of big game in Africa, like elephant and rhinoceros, are mostly unskilled marksmen who use under-powered rifles resulting in an animal being severely wounded and dying slowly. Wire snares, used to trap game, get tangled around the legs of big animals leading to horrific injuries as captured animals struggle to get free, and the necks of smaller animals, resulting in individuals being strangled to death slowly or ripping their own necks open during the struggle for freedom. The IAPF’s founder has seen a buffalo that had been caught in a snare fight so hard that it tore its own pelvis in half. Besides shooting and snaring, there are also less conventional methods of big game poaching. There have been reports in Mozambique of poachers using land mines to hunt ivory: due to the size of an elephant the mines are not usually sufficient to kill the animal instantly and it bleeds out over many days or dies of subsequent infection. Highly organised poachers in South Africa have used helicopters to track and shoot rhino. Poachers worried about the tell-tale sound of a gunshot in a national park or game reserve sometimes resort to darting animals with a drug called M99 – a substance 1000 times more potent than morphine. In the right – re: safe – doses M99 can put a rhino to sleep in around 6 minutes and is used by authorities and game reserves to tranquilise animals for treatment or de-horning. However, poachers use a much higher dose to drop the rhino almost instantly: if the rhino survives the taking of its horn (very rare) the high dose of M99 leads to severe and lasting kidney, liver and other organ damage. However, the inhumane practices of poachers are not only limited to African big game. Due to their ability to survive under extreme conditions exotic reptiles such as lizards and snakes are often smuggled in terrible places like the interior lining of a suitcase, an aluminium can, or even sealed inside trinkets like statues or carvings. Infant pythons are sometimes smuggled in CD cases, while some turtles get taped inside their eggs and shoved into socks for transit. Exotic birds, many endangered, are captured in massive nets, gagged or blind folded and drugged to prevent calling, and stuffed into boots, plastic tubes, or musical instruments to defeat x-ray machines. As a result of such treatment, some reports have said that up to 90% of live animals that are smuggled die in transit. As has been argued, poaching and the illicit trade in wildlife can have significant consequences beyond those popularly known. There is far more to conservation than the stereotyped tree-hugging, slogan-branding hippies portrayed in mass media, and the motives of conservationists are deep and diverse and not solely based on preservation of life, though this is a major part of it. Stopping poaching is not just in the interests of animals… it is in the interests of us, and in the interests of our humanity. This entry was posted in Uncategorized and tagged Africa, Centers for Disease Control and Prevention, crime, Economic, elephant, extinction, Health, Hong Kong, IAPF, International Anti Poaching Foundation, Monkeypox, Mozambique, Poaching, rhino, Rhinoceros, Security, smuggling, South Africa, Threat, tiger, trade, Wildlife, wildlife trade on August 21, 2013 by gusigb. Great read, Andy. Plenty here to think about.